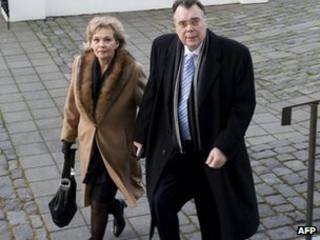 The trial of former Icelandic Prime Minister Geir Haarde, on charges of negligence over the 2008 financial crisis, has begun in Reykjavik. Mr Haarde is thought to be the first world leader to face criminal charges over the crisis. He rejects the charges as "political persecution" and has said he will be vindicated during the trial. The country's three main banks collapsed during economic turmoil and the failure of Icesave hit thousands. The collapse led to a dispute over compensation between the UK and Iceland, which remains unresolved. The proceedings are being held at the Landsdomur court in the first case for the Reykjavik-based tribunal. Some Icelanders see the trial of Mr Haarde as scapegoating, while others argue that public accountability is essential following the country's financial collapse. Iceland was plunged into a deep recession following the collapse of its three banks, including Icesave's parent company Landsbanki, in autumn 2008. Mr Haarde, 60, led the Independence Party government at the time. He is accused of being negligent because he had not ensured financial safeguards were in place. He pleaded not guilty. The former premier says he was only doing what he thought was best for the country at the time. "I reject all accusations, and believe there is no basis for them," Mr Haarde told the court as he took the stand. He said it was "the first time I get a chance to answer questions regarding this case". Before the case opened he had sought to have all charges dismissed, calling the proceedings "preposterous'' and saying that his conscience was clear. When Icesave collapsed, the then UK Prime Minster Gordon Brown accused his Icelandic counterpart of "unacceptable" and "illegal" behaviour after Iceland said it could not give a guarantee to reimburse UK customers of the online bank. In response, Mr Haarde accused the UK government of "bullying" and bringing down one of its other banks after the Treasury froze the assets of Icelandic institutions in the UK. A final attempt by Mr Haarde's independence party to have the charges dropped was rejected last week in parliament. The trial is expected to last until mid-March, with the court taking another four to six weeks to deliver its verdict.